After working a bit to figure out the most efficient way of putting all the points together, I decided that I needed to make units. First, the center star unit, then the fan units that surround it. 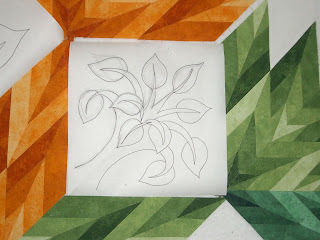 Next how would I fill in the odd shaped spaced around it to make it ready for borders. I needed more diamonds in white, then I could easily fill in the gaps with squares and rectangles. 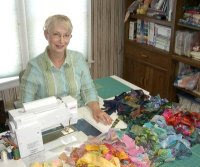 Then it was off to the races with the sewing machine. 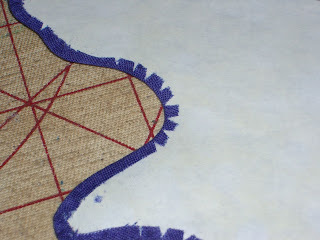 To Applique or Not to Applique, that is the question.... So, I needed to decide on what to do with the plain jane squares. Applique is always nice. But this can't be just any applique. The pattern has got to be bold enough to hold its own with the powerful colors and graphic nature of this piece. And here my work bogged down. 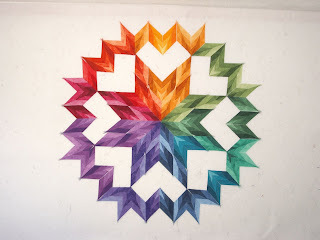 I cut a bunch of 9" squares of freezer paper, and sketched a bunch of different designs. After close examination, I thought that the outstretched fans look a little like maple leaves, so I tried drawing a large one. I didn't like it at all. I tried stylized trees, then I tried an old abstract traditional-looking friend, and even drafted a swirly heart with flowers and feathers design. None were quite right. So back to my design consultant husband. He liked the leaf I'd drawn, but I just didn't like it at all. 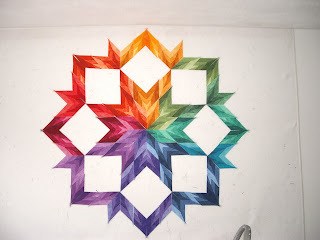 Then I consulted my friend and great quilt photographer Stephanie. 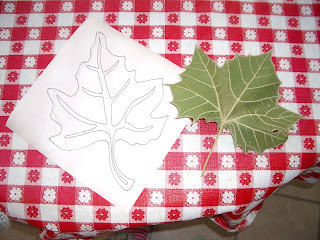 She REALLY liked the leaf idea, too. But I still didn't. With my mind kind of boggled, I went for an evening walk. I closely examined every tree I passed. (Remember, I live in Dodge City. There just aren't that many good looking trees around here.) I plucked a leaf from one rather sad-looking silver maple tree, and stuck it in my pocket. Then on my way home, I saw a rather marvelous looking tree with gigantic leaves.....just the right shape and size for the squares on my quilt. It was a tree I didn't know or recognize. I plucked that leaf, and being to big to stick in my pocket, I admired it all the way home. 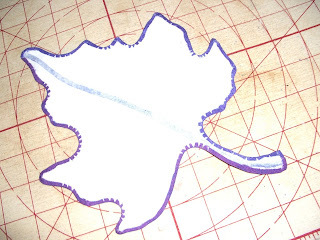 Once home, I whipped out one of my pre-cut freezer paper squares, and loosely traced around the shape of this leaf. Then I looked it up on the internet, thinking it might be of the sycamore family. It was. I think it was from something known as a plane tree. 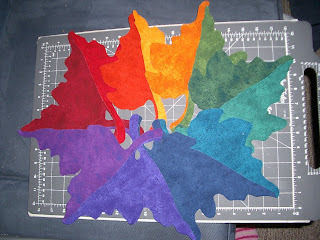 So now I was prepared for the next step: the applique process. I fine-tuned my sketch a bit, then darkened the pencil lines with a sharpie marker. 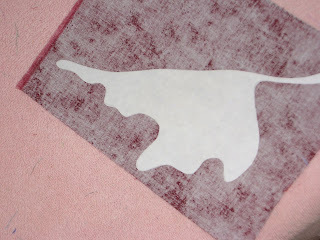 Then I traced the outline onto more freezer paper 8 times, and carefully cut the shapes out. 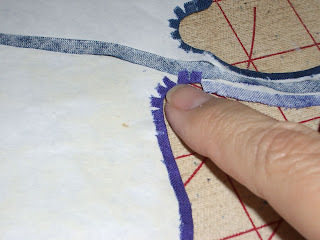 Cut the fabric out an 1/8" away from the edge of the paper, and glue the edges back over the paper. For the curves, clip into the turn-under allowance as needed to get the edge to lay flat. 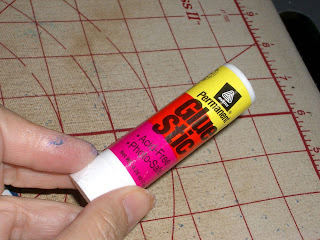 Run a little glue stick along the edge of the paper and fabric for about 2 or 3 inches, then fold the fabric edge over the paper and into the glue. 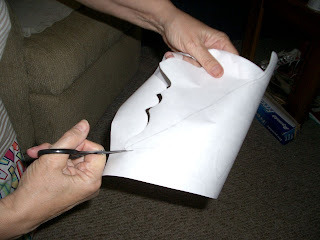 Make sure the edges are smooth, and that you don't fold the edge of the paper back, too. 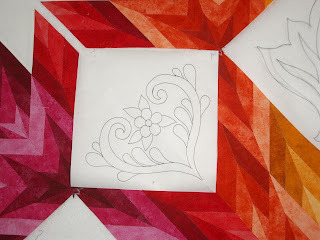 Continue this process around the entire outer edge of the applique piece. (Unless you are making a unit where the piece will lay under another. 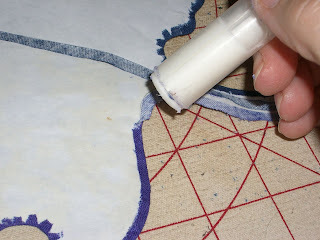 I'll refer you to Beth Ferrier's blog for great instructions using the technique.) With all the leaves taking shape, Star Crystal may need a new name. Leaf Crystal? Leaves for All Seasons? Any suggestions out there? 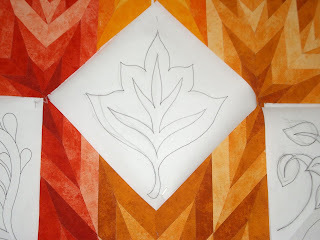 Tomorrow, I'll share the process I use for appliqueing the pieces to the squares and the applique stitch I'm using for this piece, and show you how I am finishing my leaves. Questions? 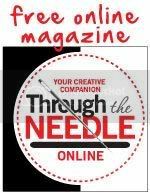 Leave a comment here, on on my website. *P.S. Don't forget the special introductory reduced price for advance purchase of my new book String Quilts: 10 Fun Patterns for Innovating and Renovating. Check it out! 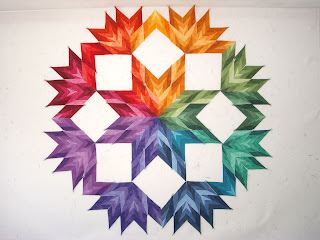 Stunning quilt!! and is this the Jinny Beyer pattern or did you come up with this on your own? Katie: All my work is original. After all, I am a designer. Thanks for your comment.